From this tutorial you’ll learn how to downgrade WordPress engine to the previous version. Let’s imagine that you’ve updated WordPress to a newer version, but your theme doesn’t support it. In this case, you might need to downgrade WordPress engine. First, navigate to Plugins > Installed Plugins tab on the left of the Dashboard (assuming that you’ve logged in to WordPress Dashboard). Select all the installed plugins and choose Deactivate option from the dropdown menu. Then click on Apply button. 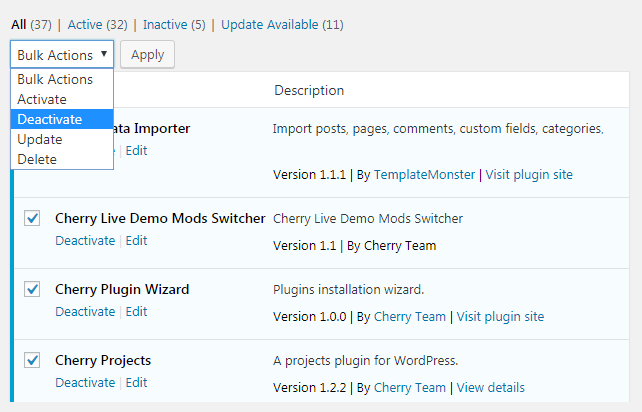 Log out from WordPress Dashboard. Now enter your hosting server cPanel file manager and delete wp-admin and wp-includes directories. You can also access your hosting server through FTP client program and delete wp-admin and wp-includes folders from there. Note, that you still have to keep wp-content folder. 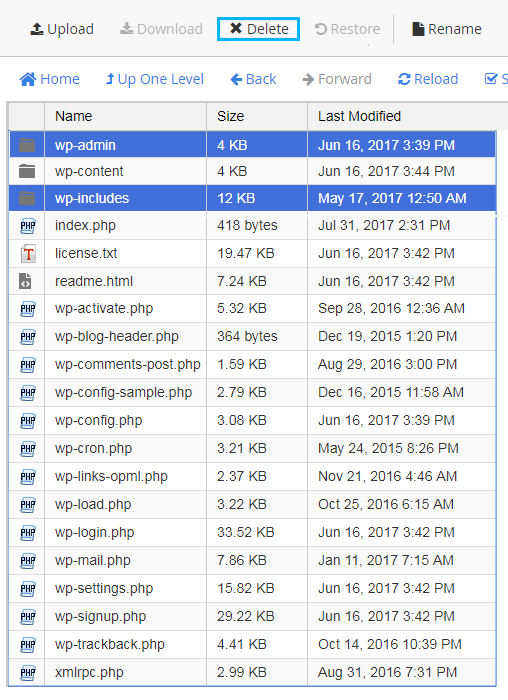 If you have a folder containing the older version of WordPress engine, please, add it to a ZIP archive (but don’t add wp-content folder to it). If you don’t have a previous WordPress version, you can find it here. But you’ll still have to unzip it, delete wp-content folder, and then pack it up again before uploading. Access your hosting server cPanel file manager and click on Upload. You need to upload it to your root directory. After uploading you need to extract the folder. Now you can log in to WordPress Dashboard using your login credentials. Here you need to update the database. This tutorial is based on Surfing Responsive WordPress theme.